One of the most annoying parts of eating healthy is that all those fruits and vegetables tend to decompose before you’re able to shovel them down your gullet. Sure, there are ways to better preserve the stuff, but those methods can be byzantine and time-consuming. It’s why foods packed with preservatives are so alluring. Annoyed with the short shelf life of his favorite ingredients, Andy George of the How To Make Everything YouTube channel sought to teach himself some of those traditional preserving methods, the hope being that he could create a sandwich that would remain fresh until he felt like eating it, even if that were a year later. In the below video, George chronicles his attempts at smoking, salting, pickling, fermenting, and dehydrating a series of common sandwich ingredients to see which methods would work and, more importantly, which ones would actually preserve flavor. The good news is that most of these methods work; after four weeks, a majority of the ingredients were still safe to eat. The bad news? 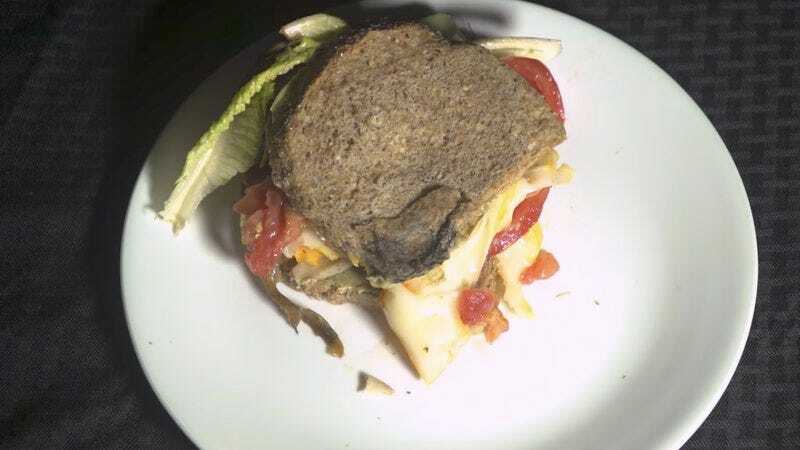 The bread, pork, cabbage, onion, tomato, and cucumber all look totally disgusting. Let us never speak of “pickled bread” again. George describes the taste of his “preserved” sandwich as “intensely dry” and “salty,” though, he emphasizes, it’s “still edible.” Yum?